On the bottom LH article, if you don’t read Spanish, the mayor of Wanchaq (the district where we live) gets his picture in the newspaper for giving toys to 2,000 kids. For all I know he’s done very little during his time as mayor. 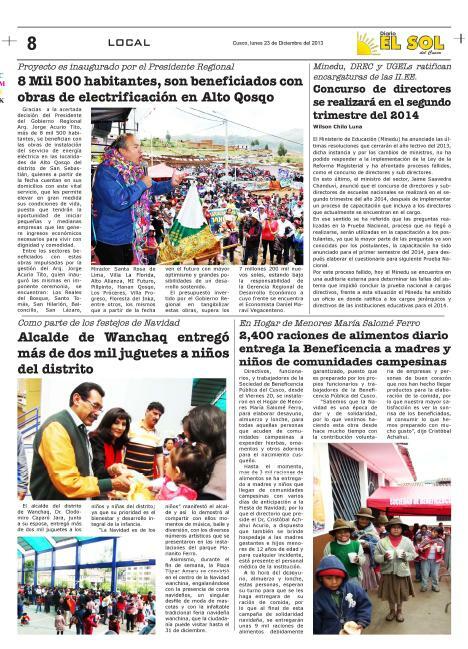 The top article is about the regional president, Coco Acurio, at an opening ceremony for electricity to 8,500 people in Alto Qosqo. My mother-in-law was in the crowd at Coco Acurio’s ceremony in Alto Qosqo. Wanna know why? Because she had to pay a fine if she didn’t participate. This entry was tagged Peru, photo-op, politics. Bookmark the permalink.